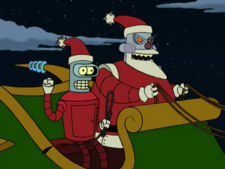 There had been complaints (three) about the previous Xmas episode, "Xmas Story", aired in 1999 so FOX was displeased by the idea of another episode being written about the robotic Santa, they made it anyway. Fox then said that they wouldn't air it in the 7pm timeslot. As a result it premiered at various panel discussions. There were phone calls from the studio asking for the violence to be toned down. John Goodman was unavailable to reprise his role as Santa, so John DiMaggio took the character from this episode onwards. Matt Groening generally hates Christmas episodes of shows. Robots being destroyed by logical paradoxes is a recurring theme in the original Star Trek series. The elves hold hands because they are gay. Ken Keeler wrote the song. They put this song in for an Emmy, other Ken Keeler songs, for The Simpsons, have won. They had wanted to show Stratego, but the company wouldn't let them for legal reasons. A list of six alternative toys and games were provided that the companies wanted shown on the air. This cartoon is said to be violent, but Popeye kills people. Too many tears from the child. The random number generator may never reach zero due to repetition of numbers. Matt Groening: ...and I hope we can get the demo version out there because you haven't lived until you've heard Ken Keeler actually singing this himself. Unknown: I still have it in my car. David X. Cohen: Neptune is kinda blue when you look at it through a telescope, isn't it? Like the gaseous atmosphere of Neptune? I believe these are accurate colours. Next time if anyone here's on Neptune, just check it out but I think it is accurate. Matt Groening: What are you talking about?